The LAFRANCE is one of 16 tools available to Genealogy Quebec subscribers. It is the most comprehensive research tool available on Genealogy Quebec. 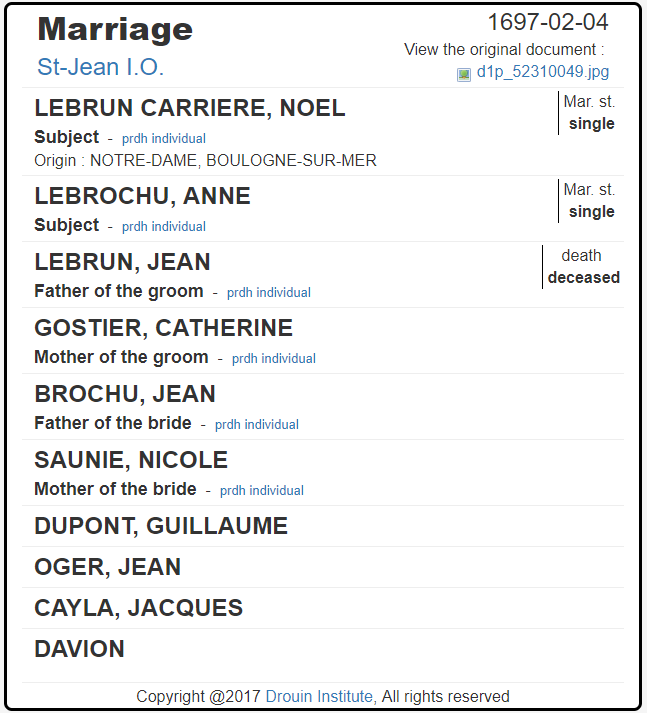 This database contains all of Quebec’s Catholic marriages up to 1917, as well as all of Quebec’s Catholic baptism and burial records up to 1861. 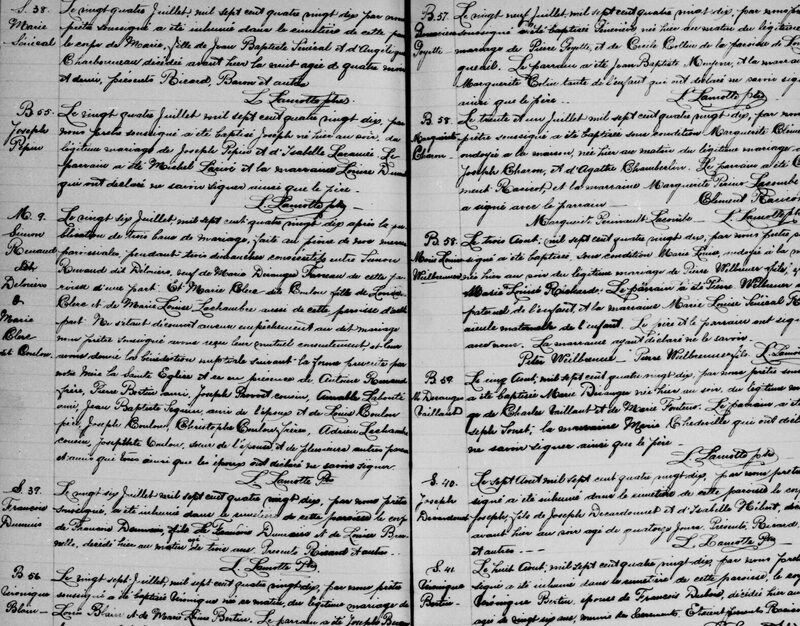 In addition to these Catholic records, all of Quebec’s Protestant marriages from 1760 to 1849, as well as 68 401 Catholic baptisms and burials from between 1862 and 2019 are included in the database. A link to the original parish document is included with every record. 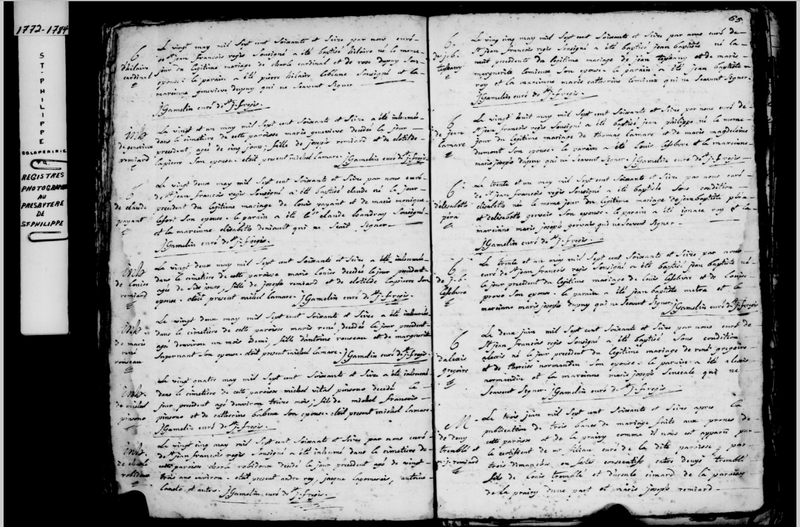 Original documents – a digitized image of the original parish register, as it was originally drafted. Record certificate – Every record in the database is indexed under what we refer to as a certificate. The certificate contains all the relevant information extracted from the original record such as the names, dates, roles, occupations, relationships, marital status, etc. The LAFRANCE is divided into 3 research sections: Individual, Couple and Parish. 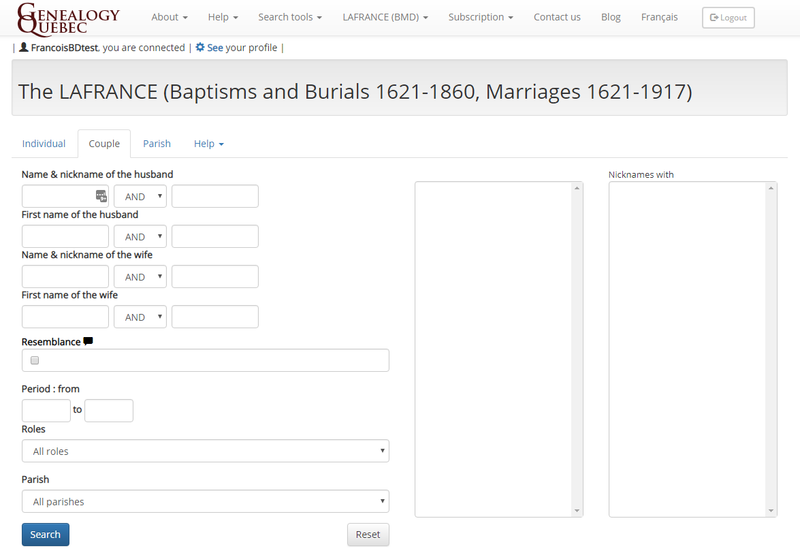 These sections allow you to search for an individual, a couple or for records recorded in a specific parish, respectively. 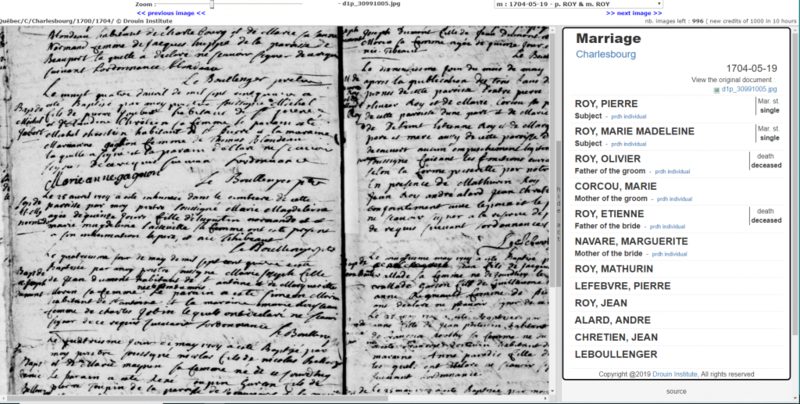 The Individual search engine allows you to search for all the mentions of an individual in the records available in the LAFRANCE. Period – Date range in which the search is performed. Leave blank to include all the years covered by the database. 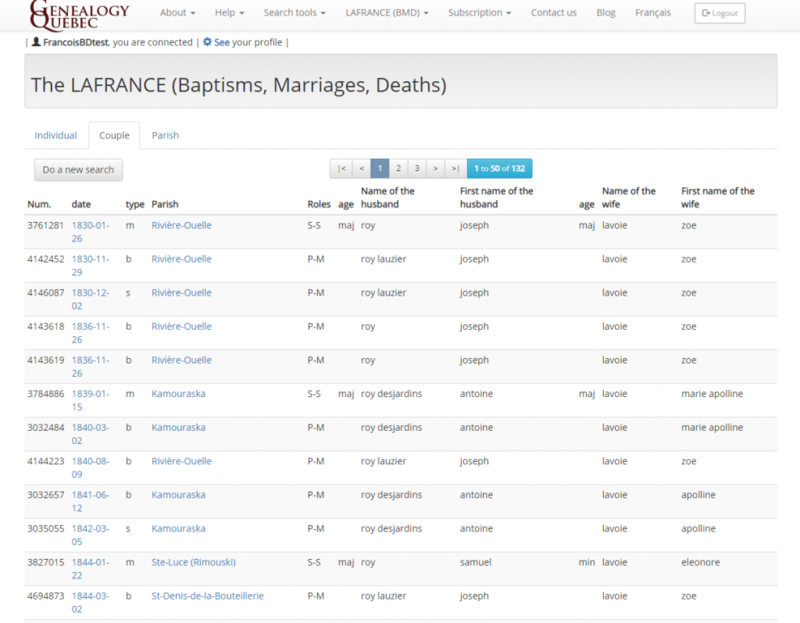 The Couple search engine allows you to search for all the mentions of a couple in the records of the LAFRANCE. A couple may be the subject of a marriage, or the parents of the subject(s) in a baptism, marriage or burial. A couple may also be the subject of a burial and their spouse. The Parish search engine allows you to search for all the records of a specific parish. 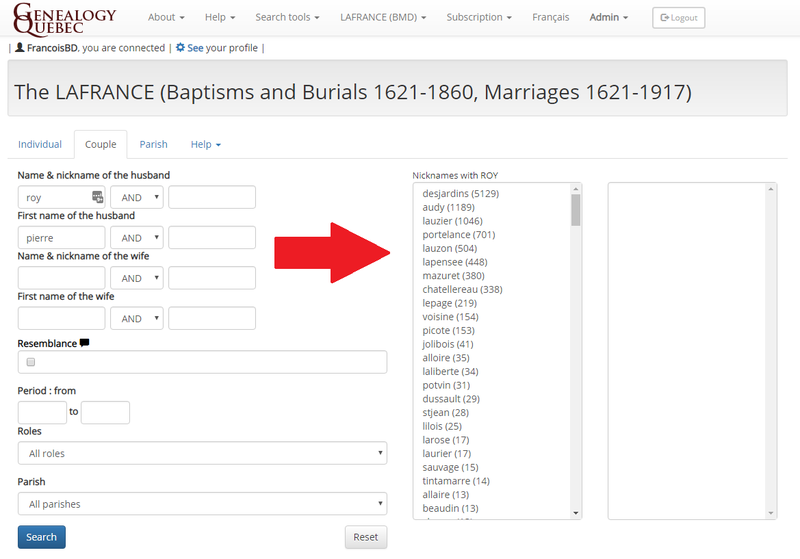 You can limit this search to a specific date range and type of record (baptism, marriage or burial). To begin a search, simply fill in the field(s) of your choice and press Search. You will then reach a list of results based on your search criteria. Num. : Every record in the database is given a number that is used to identify it. Clicking on the name of the parish will take you to the location of this parish on our interactive map of Quebec based Catholic parishes. To view the record certificate, click on the date associated to that record in the list of results. The record certificate contains all the relevant information extracted from the original document. You will find the names of the subject(s) and the parents, the role and the relationship between each individual mentioned in the record, the date on which the record was drafted as well as the date of the event, the marital status of the subject(s), the age of the subject(s), and more. To view the original document itself, click on the image link found under the date of the event. If you have already done genealogical research in Quebec, it is likely that you’ve encountered “dit” names before. A “dit” name was used to differentiate individuals with similar family names in the same region. In the context of genealogical research, “dit” names can be viewed as a second surname given to an individual. For example, a common “dit” name combination is Roy dit Desjardins. If you descend from the Roy dit Desjardins line, your ancestors will have gone under Desjardins, Roy, as well as Roy dit Desjardins over the generations. This can be a bit confusing if you’re not aware of it, as you may wonder why your ancestors would suddenly switch between two surnames. 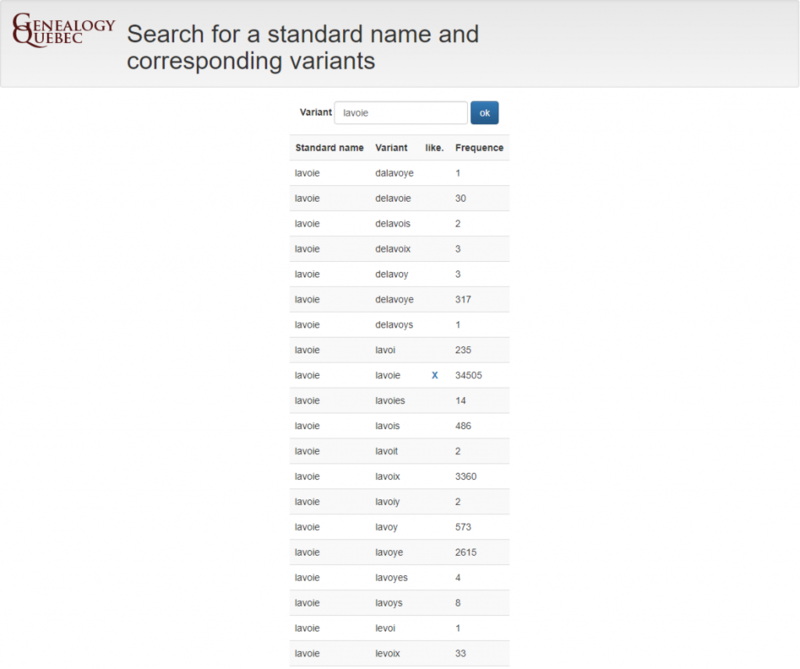 This is why the LAFRANCE includes a Nickname tool, which gives you a list of “dit” surnames commonly associated with the last name you are researching. When you enter a surname in the search field, a list of “dit” names commonly associated to that surname will appear in the box to the right, ordered by frequency. 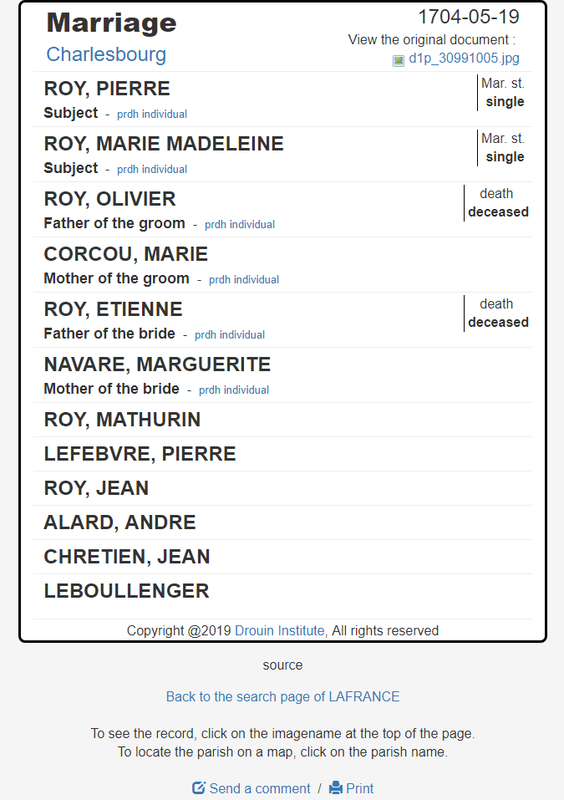 This tool is very useful because it can allow you to trace a line that has gone under different family names over the generations. For example, if you are unable to find the marriage of the parents of your ancestor Pierre Desjardins, you will be aware of the possibility that the father of Pierre Desjardins bore the name Roy on his marriage, allowing you to find the record in question. The LAFRANCE search engine is equipped with a name dictionary, which associates a name with all of its variations. For example, a query for an individual with the surname Gauthier will prompt the search engine to look through the database for any mention of the name Gauthier as well as any of its variations, such as Gautier, Gaulthier, Gotier, etc. Thus, it isn’t necessary to manually search for multiple variations of a name. You may browse the LAFRANCE name dictionary at this address. Please note that when searching on the LAFRANCE, the result list will always show the standard spelling of the name(s) you searched. However, the record certificate will give you the specific spelling used in the original record. The resemblance function, otherwise known as the likeness function, makes it possible to search for a name as well as any other name that resembles it. The resemblance function differs from name standardization because it not only includes all of the variations of a name, but also all of the names that are similar to it in terms of pronunciation or spelling. For example, a search for Gauthier, which will include all of the variations given earlier, will also include the names Gonthier, Vauthier, Gouthier, Authier as well as their numerous variations. 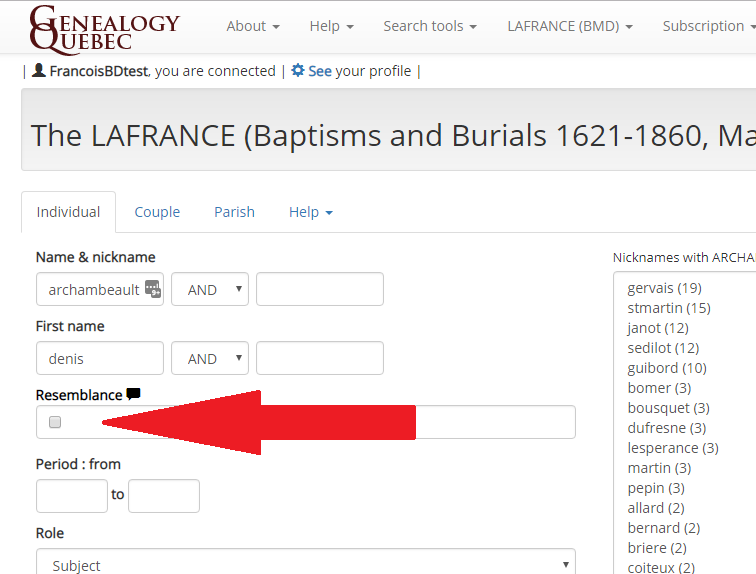 You can activate the resemblance function by checking the resemblance box on the LAFRANCE search page. We recommend that you keep the resemblance function turned on at all times. 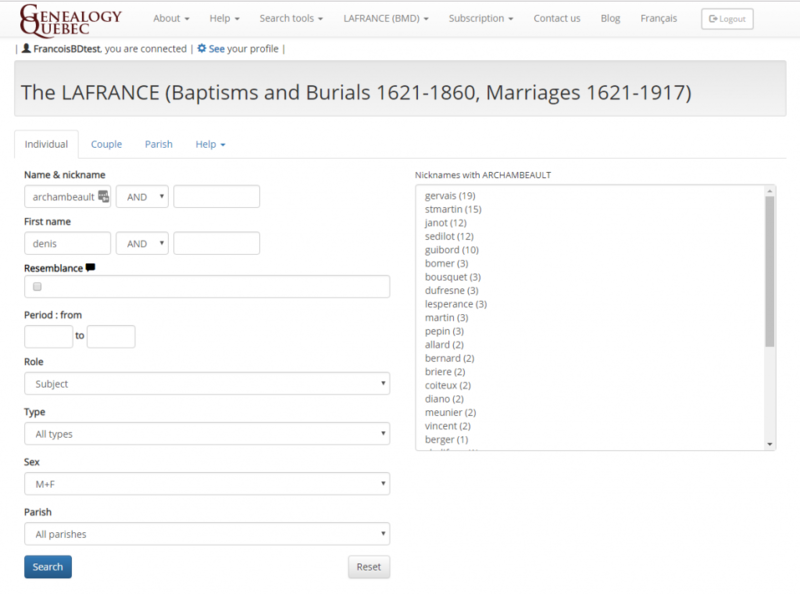 The LAFRANCE’s search engine allows searching for many variables, which makes it tempting to fill as many fields as possible when using the tool. However, we recommend that you keep your initial search as vague as possible, and clarify it as needed by adding one piece of information at a time. When the name or surname searched is rare or unusual, it is rarely necessary to add more information to the search. For example, an initial search could start with the surname and first name of the subject. If the number of results is too high, a variable such as the year of the event or the surname of another individual mentioned in the record can be added. Often, simply adding a third variable is enough to narrow the search down sufficiently. And so on. As a result, if an error exists in one of the first or last names of the subjects, we will still be able to find the record. Finally, note that you may use the “%” character in order to search for part of a name. For example, a search for “Rog%” will find all of the records where an individual bearing a name that starts with “Rog” is mentioned. This allows you to widen your search even further, if necessary. If you are subscribed to both PRDH-IGD.com and GenealogyQuebec.com, you can view the PRDH-IGD individual file of an individual mentioned in a LAFRANCE certificate with a single click. To do so, make sure you are logged into both websites, and then click on the “prdh individual” mention found on the LAFRANCE certificate you are viewing. The individual file centralizes all of the mentions of an individual in the database, such as the person’s baptism, burial and marriage. The individual file also mentions the parents as well as the spouse(s). You can read this article for more information on individual files and the PRDH-IGD. You can also learn more about the similarities and differences between PRDH-IGD.com and GenealogyQuebec.com on this page.